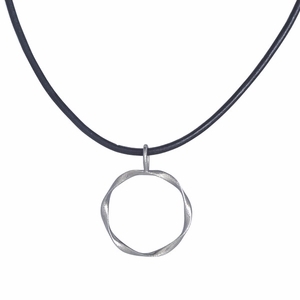 Pure Jewelry, Eyeglass Loop, or Sunglass Loop - Triple Twist (Stainless Steel with Black leather cord) - New! This Triple Twist Glasses Holder, is cast in tough Stainless Steel. Its strong design makes it striking jewelry. But it also can be used as a glasses holder. The opening is 30mm diameter (roughly 1" wide). Perfect for fitting most reading glasses or sunglasses through the loop. The cord is made of black leather. The Triple Twist is an original design, copyrighted by Richard W Berman. It's only available at Architects Touch!